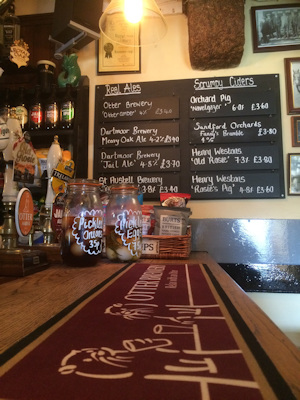 We are renowned for a well-kept quality real ales and scrumpy ciders. Recognised by The Good Beer Guide for over 10 years. 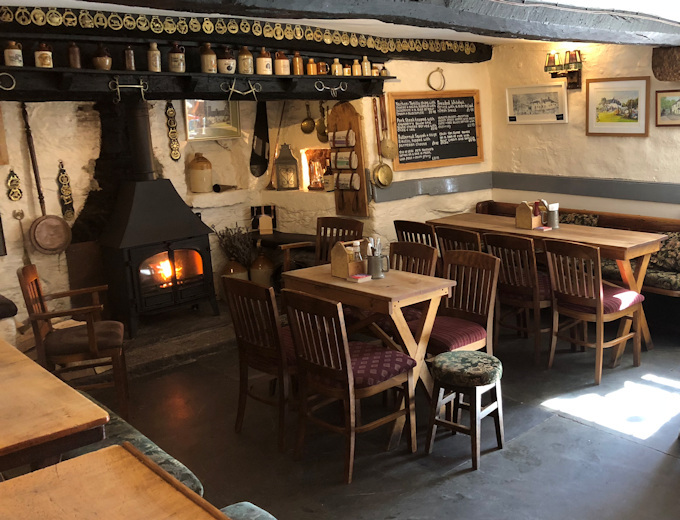 Join us in the bar and sample one of our fine cask conditioned ales; either our own Meavy Oak Ale, brewed on Dartmoor by Black Tor Brewery or one of our resident or guest real ales, all from local brewers. If tradition is what you are after, and you like cider we have a great range of scrumpy ciders from Devon cider producers, Hunts and Sandfords. You really must try them. There is also a comprehensive range of gins, rums and wines available. See our Gin List, Rum List and Wine List for details. Please note children under 8 are not allowed in the bar in the evening. The cosy bar at The Royal Oak, with a log fire to keep everyone warm in the cold days of winter.